I do not see "Samsung Galaxy" on others' example posts from their Battery display. 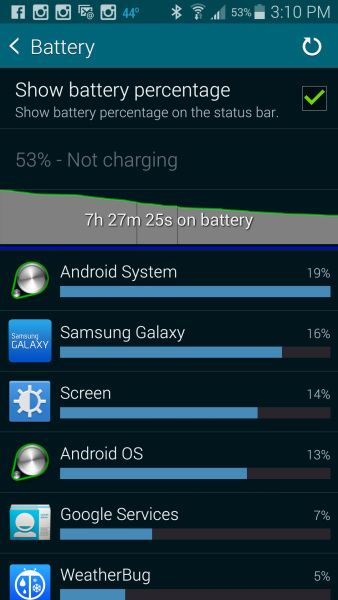 What is this app, and why would it be consuming so much battery on my S5? Further research, including examining App Info, indicates that this is com.sec.android.app.sns3 or SNS, which some have indicated is "Social Networking Services." Why such a drain on my S5? It's considered annoy-ware. It's not malicious, but it is something added to your phone that you didn't ask for and it does use battery and resources. So it would appear that SNS is somehow linked to Gallery. Could the high CPU utilization be because I am syncing photos from my Facebook account to the S5 Gallery? The sync itself of over 5,5000 photos.has completed, but the high CPU utilization of Samsung Galaxy (SNS) continues. There is definitely a relationship between the SNS ("Samsung Galaxy") app, the Gallery and high CPU utilization. When I open the Gallery with its > 5,000 synched FB photos, the Samsung Galaxy process becomes a high CPU consumer until I close it. I will experiment with breaking the synching with my Facebook Photos and see what happens. Yes I am hardly using my G-S-5 and it went to 17 % from full last night to 68 by morning. 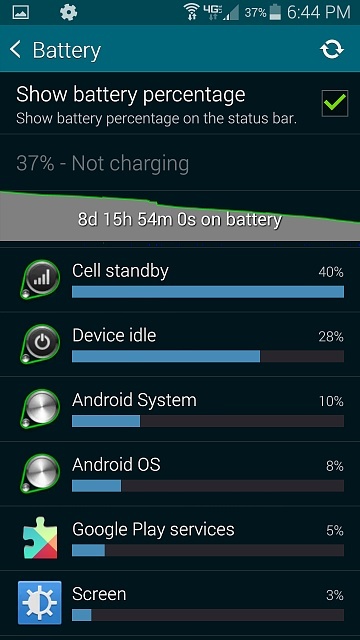 This big Battery should last two or three days, come on now lets have some answers. one more thing I turn off all apps every trip to use ! Nothing I mean Nothing should be running. After further experimentation, I have found that Gallery alone is the culprit. Once opened, the "Samsung Galaxy" (SNS) process begins consuming 15% to 20% of the CPU even if all synching is disabled...including synching to Google Photos, to Facebook and to Dropbox. "Samsung Galaxy" doesn't stop consuming CPU until you go to the task screen and swipe the Gallery closed. Turn off the WiFi and MobileData radios when you are not actually using the phone. If you do that, nothing can call home to mama Twitter or Facebook or anything else. Here is a picture of my wife's S5 with MacroDroid installed which turns off both WiFi and Data when the phone is idle, turns both back on when the phone is unlocked. She only makes phone calls, nothing else. Note that if the S5 is idling and not talking to all that social crapware out there, it can go 9 days and still have 37% left to use. And she don't even have to think about how to be a geek... indeed, the closest she gets to being a geek is to use the remote control on DirecTV. Through further experimentation, I have found that clearing the Gallery app data has resolved the problem entirely... It would appear that the issue was caused by the previously synced 5000+ Facebook photos. Once I quit synching to these photos AND cleared the Gallery app data, the Samsung Galaxy (SNS) task no longer consumes CPU and battery every time Gallery is opened. Interesting to note also that turning off the Samsung Gallery task at one point caused Facebook account synching options to vanish under Settings -> Accounts -> Facebook. How can I view CD photos on my G5 and transfer same to the card/phone memory? I cannot assign photos to my contacts list. How do I assign the photos on my Samsung Galaxy S5? How do I recover my password for my Galaxy S4?